Being able to correctly size your workforce is an integral building block of success for your organization. As Samuel Bacharach, McKelvey-Grant professor in the Department of Organizational Behaviour at Cornell university says, “more often than not, [leaders] have not looked deeply into their core scale challenge: how will size impact how they lead, and how they structure the organization, and design the work” . Organizational redesigns have become almost ubiquitous across industries and sectors, as companies reshape their organizations in response to disruptors and ever-changing regulatory landscapes. Some 60% of organizations  said they had been through an organization transition in the past two years, with the majority running out of steam after beginning, failing to meet objectives or improve performance after implementation. We believe that one of the key reasons transformation programmes don’t succeed is because they don’t have a robust way of assessing the number of positions required, beyond guesswork. Rightsizing your organization can be a complex and often thankless task. Sizing often occurs as a result of four dangerous approaches: assuming the size will just evolve, heeding the executive who shouts the loudest, or taking across the board cuts or in line with some predetermined ‘magic number’. None of these factors offer up data points and metrics to provide an informed, evidence based decision that will enable you to make informed choices in support of your objectives. The pitfalls of a poor approach to rightsizing should not be underestimated. For example, it’s estimated that failing to correctly size your sales force can lead to the loss of 2-15% of profitable revenue growth . At Concentra, we believe there are several far more prudent approaches to sizing which lead to more accurate and sustainable results for an organization. One such approach involves using an evidence and data-driven assessment of the work people do and the effort required, coupled with specific identification of opportunities for growth and improvement, to calculate the future size of roles, functions and ultimately the organization. An individual activity analysis (IAA) is one way to form the foundation for sizing your business. An IAA provides a rich insight into the as-is state of your organization. It focuses on the work – linking the activities employees do with the time they spend doing it. A taxonomy of the organization’s activities forms the basis of a survey sent out to employees or their managers; this can be developed where it has not been defined within the organization. The survey collects two key pieces of information from each participant. First, each employee is asked to allocate the time they spend on each task. Second, we ask the workforce to tell us whether they Approve, are Responsible for or Support each of the activities they allocated their time to. This methodology of mapping Approvals, Responsibilities and Support simplifies how roles are mapped to different activities – the RAS framework. Our approach  takes the RACI framework, and does away with the ‘ACI’ aspect (A = Accountable, C = Consulted, I = Informed), in which R&A can often be the same person and deciding who to keep consulted and informed is painful and decreases efficiency. We also use RAS as a foundation for providing role clarity, establishing clear priorities and designing minimum viable bureaucracy. The IAA gives us a view of how the organization invests its time today. We can measure overall effort as well as effort and cost spent on each activity, how fragmented an activity is, how bureaucratic it is, and even how much re-work is associated with it. These are all extremely powerful data points for analysis of an organization. Additional data that can be captured include the amount of overtime spent by employees, as well as qualitative questions which add to the richness of information collected. Having understood your organization’s current activities and the effort (FTE) attributed to them, the next step is to think about the work you’ll do in the future. Will you grow into new market segments, new geographies? Will parts of your business need to rapidly scale while other areas could be made more efficient by emerging technologies or AI? These questions are central to understanding how work will change and therefore how you address the “size challenge”. We consider actions (or ‘levers’) that can be applied to an activity. For example, you could Stop, Reduce effort, Consolidate, Reassign, Improve efficiency or Outsource existing activities. You may also want to add entirely new activities. By thinking about the activities required for your organization in the future, business leaders are able to shape what work will be done in the future, how current activities can be improved and how much effort needs to be dedicated to them in the to-be organization. We worked with a global company across multiple geographies to determine the size of the organization as they began to shift the focus from a mono-line business with sales through traditional channels to a new, multi-product omni-channel organization. Many of the existing activities were made more efficient or stopped as the business turned to their new offering, while simultaneously increasing the volume required in several areas, and introducing new activities (for example around the creation of an e-commerce group). With future activities and effort required defined, it’s important to define the roles that will be needed to accommodate the future workload. Depending on the scale of change from the as-is to to-be states, you may find many new roles necessary, whereas in other cases only one or two will be added or removed. Importantly, this only refers to roles and not positions, i.e. there may be multiple FTEs each carrying out the same role. Once they are agreed, the updated activities are mapped to the to-be roles using the RAS approach outlined above. So, we have the amount of effort required for each future state activity from the Activity Levers workshop and now also the accountability (RAS) mappings for the to-be roles to to-be activities. 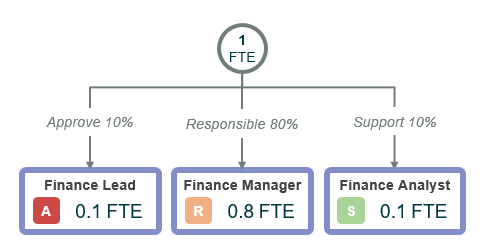 This allows us to distribute the effort (FTE) required for each activity to roles, and therefore size the to-be organization as a whole. The sizing algorithm uses simple assumptions to distribute effort from activities to roles and can be customised to address specific needs. The sizing calculations are completely automated; once in place, you can change activity FTE allocation, roles and more, and the to-be sizing will be updated dynamically. The answer the algorithm provides is not meant to be prescriptive; but to provide the evidence to make good quality decisions rather than relying on guess work. Our sizing approach allows you to do away with complex macros, hundreds of spreadsheets and an army of consultants. Instead, we simplify what can be an extremely challenging and complex process, enabling a methodical and data-driven path for determining the future size requirements of your organization.